What is next for humanity? Are we facing mass extinction due to pollution, species loss, climate change and a looming energy crisis? Are we on the verge of a collective awakening and the dawn of a new, Golden Age more magnificent than anything we have ever known? Two scenarios are dancing together in apparent paradox! This book deeply explores them both through a synthesis you have probably never encountered before. Full of the latest information on what is unfolding on planet Earth, Awakening at the End of Time will not only answer these important questions. It will also take you on a journey of transformation and awaken a deeper knowing that the End of Time is a portal into a luminous, new beginning. Click here if you would like to know more about Awakening at the End of Time. For years, we’ve wanted a book we could recommend to awakening souls — a manual that clearly spells out how to do two fundamental things. These two foundations of awakening are so simple, we often overlook them in our fascination with the endless complexities of the spiritual path. But from 30 years of supporting the process of awakening, we know for sure that the core of awakening can be described in just a few words. As we awaken, we release who and what we are not, and remember who we are. Anyone who has tried to let go of a troublesome inner dynamic knows the process isn’t always simple. This book distills all that we’ve learned about how awakening happens. It gathers the wisdom gained through 30 years of facilitating awakening into one simple-to-read volume. Along with the words, there are also guided inner Experiences you can download — for free. You will not only READ this book, you will directly EXPERIENCE everything it presents. It is a living journey of transformation and awakening. More than words, it contains a transmission of possibility to catalyze your journey of awakening. This is how you will live into the next steps in your awakening. Awakening doesn’t need to be difficult. Taking Off Overcoats will walk you through the process of letting go of who you are not, so you can more fully live as the eternal, divine Self that you are. Isn’t that what we all want most? So, how would you like to read Taking Off Overcoats? However you purchase the book, it includes a link to the FREE mp3s for all of the guided inner Experiences. These Experiences bring alive everything the book says. When you engage with them, you will be directly experiencing awakening. Interacting with these Experiences as you read the book powerfully catalyzes awakening. If you feel that the time to awaken is NOW, this book is for you. And if you’ve been on a journey of awakening for some time, this book will expedite experiencing even more freedom, aliveness, and radiance! Have you been on a spiritual path, yet do not feel deeply rooted in who you truly are? Do "unfinished issues" seem to be in the way of your spiritual awakening? by the unresolved traumas of the past? and rest more fully in the limitless ocean of the Divine? Are you feeling compelled to more fully realize your true, divine nature NOW? Universal Christ Series:What is God? What is the Goal of the Path? The core of the spiritual journey is awakening to who we really are and consciously communing with the Divine in us. This is the shift from perceiving ourselves as the egoic, human self, with its fears, limitations and self-judgments, to knowing we are a Luminous Self, with its limitless divine capacities and qualities. The core of our work is directly experiencing your true, divine nature, and progressively embodying That. Everything we offer — modules, private sessions, groups and teleconferences — is designed to support you in the all-important shift from believing you are a small, human self to knowing you are a vast, magnificent Self. Awakening to the Self is "One-stop Shopping." All that we seek "out there" already lies within us, waiting to be discovered. The peace, joy, abundance, love, fulfillment, and freedom we yearn to experience are essential aspects of our true Self. These and many more divine qualities and capacities naturally flower as we deepen communion with our true nature. Problems, challenges, conflicts, and dis-ease multiply when we are not living from our essential Self. So-called objective, "outer reality" is but a holographic projection of our inner state. When we are asleep to who we really are, our inner fear, pain, and conflict inevitably manifest in our outer lives. As we come to know that we are a vast, Luminous Self, not a small, limited human being, everything in our lives begins to rearrange to express our divine nature. Ego-distortions give way to the coherence and harmony of the Self, which is rooted in the Divine. Who we are becomes the answer to every question. It is not an exaggeration to state that we are all awakening Buddhas, Krishnas, and Christs. These and other Great Ones were not fundamentally different from us. They simply demonstrated what lies within each of us, waiting to be discovered and expressed. Buddha insisted, "All beings have Buddha nature." Christ Jesus promised, "Greater works than these shall ye do." This is our ultimate destiny as souls. This is how personal and planetary heaven on earth unfolds. What Will You Gain From this Work? awakening to who you really are. the Luminous Self that you are. release all that you are not. It is a progressive, ongoing process that unfolds over time. What you receive from this work will exactly mirror your level of commitment to awakening. If you approach this work with a deep consecration to awakening — if awakening is more important than anything else in life for you — you will experience the greatest benefits from everything we offer. Powerful shifts typically occur during even one Luminous Self session. But if you engage with this work as a cumulative process, you will find that momentum grows over time. Progressing through the Modules and a series of private sessions, you will experience all the places in consciousness that are a part of you — and therefore a part of your unique process of awakening. Awakening to who we truly are is the whole point of human life — the goal that pulls us back to Earth, lifetime after lifetime. There is nothing more important than this! ​Simply put, our presence catalyzes awakening. For several decades, our lives have been dedicated to awakening. Each of us has been blessed with many profound experiences of awakening. As a result, we are able to directly induct others into powerful experiences of the multidimensional, Luminous Self. Our state of consciousness functions like a tuning fork. Since we primarily rest in the true Self, others easily enter into that space in consciousness in our presence. Our journeys of awakening have included the vastest realms of light and the darkest depths of despair and hopelessness. We’ve learned how to meet whatever arises with love and acceptance, and that, too, becomes easier for others in our presence. Our balanced, integrated approach to awakening includes all levels and dimensions of being, from the highest super-conscious realms to the depths of the subconscious. 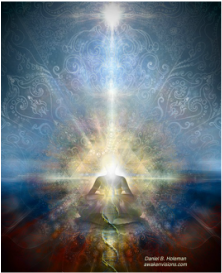 Decades of facilitating sessions enable us to hold a deep, vast, loving, and clear space in energy~consciousness. This helps you to face and embrace the core patterns of your suffering and move through your “stuff” into greater Self-Realization. We show you the easiest, most effective ways to move through the ego-resistance that arises on the way to the soul. The Universal Christ overlights our work. the blessing~grace and Resurrecting Power of the Christ pour in to accomplish what no mere humans could ever bring about. We also call upon many Ascended Masters and divine beings to help you move through your traumas and suffering and awaken. We know that we are not the ones making things happen. The Divine does everything through us. “I am basking in the glow of my soul's peace. How can I ever thank you well enough for this profound gift you have given me?" "I don't know of anyone else I could do this work with, who would be as non-judgmental and accepting of anything. You have an incredible facility in creating a safe, open space." "You've given me the greatest gift -- there's a place beyond non-dual emptiness. I can be connected in my heart. There are no words for this softening...this tenderness...this grace." "I know now there is a place within me I can always go to, a place that is always peaceful. I can find my answers there." "I have developed a connectedness to myself and the universe. I now understand the void and can accept and be patient with it. I appreciate your experience, support, acceptance and unconditional love." "Barry and Karen's sessions are vibrant aliveness; real time; nothing to remember; folks, there is no quiz afterwards! This is not a didactic, formulaic approach to transcendent consciousness. You don't engage in ‘Practices' for two years with the hope of getting somewhere. Barry and Karen quite simply embody pure sweet loving consciousness; it's like the way my puppy or my nana loves me. It defies explanation or description, it lives in the world beyond words, and [is] truly all you ever really wanted!" "I never dreamed it would be so easy to connect with my soul and get my own guidance." "Thank you for that wonderful and insightful, supportive and expansive session -- wow. I really felt that was a doorway to somewhere special." "You've given me back to myself." Does This Approach to Awakening Resonate? If our approach sounds useful, we suggest that your first step be to set up a free, 20-minute consultation. We’ll discuss where you are in your journey, and consider what your next steps might look like. Together, we will determine the very best approach for you to access our work. At any point in your exploration, you are welcome to contact us for a complimentary 20-minute consultation. A brief talk together will give us all a big-picture overview of your unique process of awakening. It will clarify how our work can support your awakening, and help you to choose intelligently from among our offerings. Reading our books will increase your understanding of what we offer and our approach to awakening. Working with the Modules and experiencing a series of private sessions as needed, over time, will help you to develop the consciousness skills that will ease and expedite your awakening. You are free to dive into our website, the Modules, and our books on your own, but you will probably get much more out of them after we talk together about your particular situation and determine some possible starting points. Email us to set up a complimentary 20-minute consultation.